When I first started working in the energy industry in 2010, the Government was about to launch subsidy support to encourage the deployment of solar power generation. The Renewables Obligation (RO) scheme had been in place since 2002 but combined with the introduction of the Feed in Tariff Scheme (FiT) in 2010, deployment of solar PV on rooftops and larger ground-mounted schemes boomed over the following years. Those landowners with a suitable land or buildings and grid combination benefited from energy savings and an export income, and for those who could rent land to solar developers/operators, a rental income. However, the runaway success of the RO and FiT schemes was greater than the Government had budgeted for, and the RO scheme was effectively closed to new developments in July 2015, with the last being commissioned in March 2017. FiT rates were also slashed dramatically, and will be closed to new installations in April 2019. The closure of the RO scheme, in particular, killed the market for large-scale solar farms from 2015. Meanwhile, industry activity around energy generation from gas and the use of battery storage were presenting new opportunities for landowners. These continue to exist for those with suitable sites, although current market factors are making gensets a better opportunity than battery storage. Since 2015 the industry has been waiting for a crucial time point when the cost of solar technology has reduced sufficiently to combine with wholesale costs of power increasing enough to make large-scale solar schemes financially viable in a zero-subsidy world. In the industry, this much longed-for point is known as reaching ‘grid parity’. In September 2017, Anesco completed the construction of the first “subsidy-free” scheme in Buckinghamshire. It was a co-located solar and battery storage scheme, and was unique in that there were no grid connection costs – as it piggy-backed onto an existing grid connection at an adjacent solar farm – and it is able to achieve substantial revenues for the storage element of the scheme. So as much as this was a good news story, and reflected some great, pioneering work by the Anesco team, it didn’t immediately pave the way for subsidy-free, large-scale, standalone solar schemes (that is, without storage and on a dedicated grid connection). The costs of solar technology are coming down and are projected to substantially lower over the next few years. Bloomberg New Energy Finance has projected that Chinese solar panel costs will fall 34% in 2018 alone, similar to the 2016 price drop – and this month the EU lifted the minimum import price (MIP) which has been imposed on imports of Chinese panels since 2013. Some commentators believe this factor alone could lead to an increase in solar deployment of 30%. Add to this, the fact that in recent months, developer-operators of large-scale solar farms are seeing a strong market for Corporate Power Purchase Agreements (cPPAs). Further, Npower are seeing significant rises in the underlying wholesale price of electricity – as much as a doubling between winter 2017 and winter 2018 from £35/MWh to £75/MWh. These cPPA and wholesale energy values and the falling technology costs are now at a point to give many developer-operators the confidence to invest. Some are building schemes to complete in 2019 (although limited in number) and we see ‘business-as-usual’ returning to the large-scale solar market in 2021. To be a viable solar scheme, the cost per MW must be incredibly low. To achieve sufficient economies of scale they will typically be schemes in excess of 10MW, which equates to a site of at least 40 acres. While the technology cost threshold is coming down all the time, it will be vital that grid connection costs for any scheme are low too – and thus the site and local grid conditions must be right. With opportunities returning, large-scale solar, located with or without batteries, can offer landowners with the right sites a strong diversification income. This summer we have seen ground rent offers for solar of more than £150,000 per year, for larger sites, with leases generally for 25+ years. But rental values will vary considerably depending on many site factors, not least of which are planning prospects, topography and grid connection costs. Big schemes will take a long time to get through planning – a 100-acre scheme identified now is unlikely to be in construction until 2020/21. But by this time the technology costs will have fallen further, and power prices will have, theoretically, increased – making the market for large-scale solar site stronger. To maximise chances of benefiting from long-term income opportunities from large-scale energy schemes, landowners should ensure that they secure any remaining viable grid capacity ahead of their local competition – and to get the best deals from developers they should do this independently of any developers. Getting independent advice to identify suitable viable sites with appropriate grid capacity quickly will put you in the driving seat. 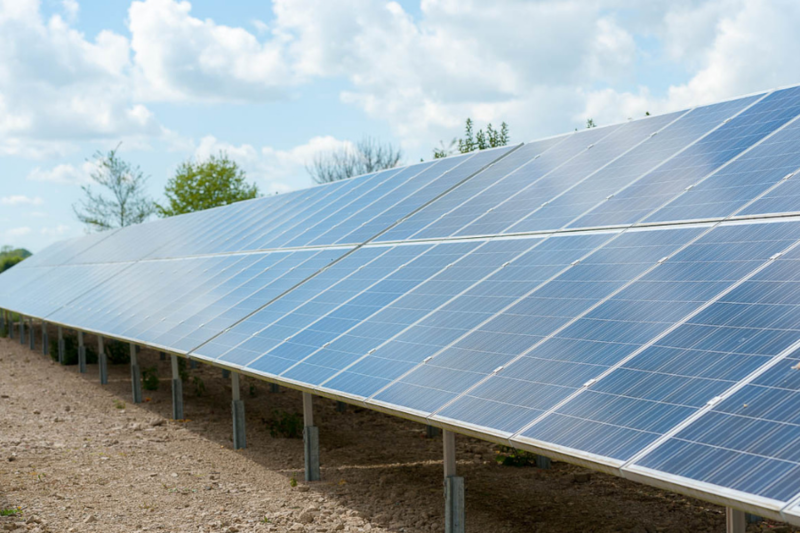 We can assess sites and the local electricity network for large-scale solar, and other energy opportunities, with our Stop/GoTM feasibility from as little as £350+VAT. We are independent from any technology or developer, so will advise the most suitable technology for the local grid and the one which offers the landowner the greatest income potential. If a site has genuine potential, we will prepare, submit and manage a grid application for the appropriate technology on a no-win no-fee basis. And, if we secure a viable offer, we attract the strongest deals for our clients by inviting competing offers from the best-performing power scheme developers. To find out if you have a genuine opportunity for a large-scale solar site, book our Stop/GoTM study today by calling us on 01993 830571 or send us a message via our contact form.